Camping.se is a website run by SCR Swedish Camping, The National Swedish Campsite Association. At Camping.se you’ll find more information about Swedish campsites than anywhere else. There are 400 campsites with 75000 pitches, 9000 cottages and rooms, apartments and B&Bs. All the campsites presented at Camping.se are members of SCR Swedish Camping, The National Swedish Campsite Association. As an SCR Swedish Camping member, a campsite follows the rules and guidelines aimed at offering its guests a safe and pleasant stay. SCR Swedish Camping (The National Swedish Campsite Association) is a trade organisation for Sweden’s campsite and cottage managers, or, rather, for those that meet our standards. We currently represent 400 beautifully situated campsites all over Sweden. To ensure that our guests have a safe holiday, we regularly inspect our members’ facilities. Our requirements cover guest safety and that campsites are well managed. We have high standards, so our guests can feel safe at campsites that are members of SCR Swedish Camping. So, before you check in, look for our membership sign and you’ll make a safe choice. Welcome to SCR Swedish Camping-member campsites! You can book your accommodation direct at Camping.se. Not all campsites can be booked, but many have some accommodation that can be booked. 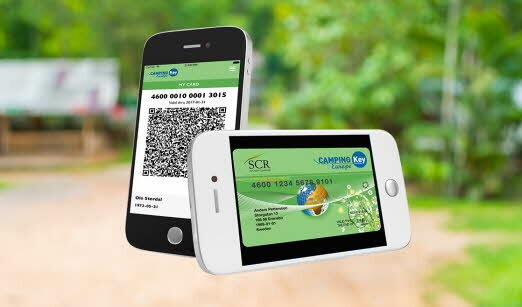 At Camping.se, you’ll find everything you need to know about Camping Key Europe. The card is packed with offers and free accident and third-party insurance. Camping.se always has great offers, exciting packages and good-value campaigns to take part in. Are you surfing on a tablet or via a mobile phone? It doesn’t matter. Camping.se works with tablets, smartphones and computers, so you can always find a campsite and be inspired by everything Sweden has to offer.